Growing pants indoors isn’t a walk in the park. Unless of course, you have an incredible green thumb, you couldn’t really ensure the finer aspects of horticulture as you would in a greenhouse. So, why not get a greenhouse home? The EcoQube Air is something that could make this a possibility thanks to the ‘light therapy’ it brings to the forefront. The little greenhouse comes equipped with lights and a soil-less hydroponic system as well as an air-filtration system, which not only contributes to the quality of air indoors but also makes sure that your plants and herbs thrive in any condition. The light therapy will help synchronize our circadian rhythm, creating consistency in the light and dark times. 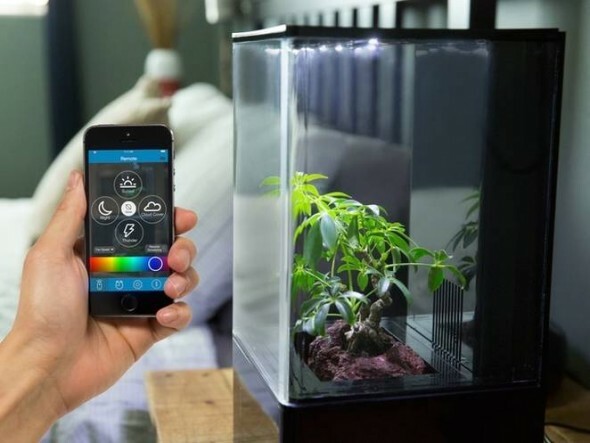 Speaking about the EcoQube Air, Co-founder and CEO of ADI said, “We believe the EcoQube Air will help people feel better and improve their home and working environments by bringing nature inside.” We couldn’t agree more. The funding on Kickstarter is a huge success with the initial fundraising goal already achieved with 59 days yet to go. It will cost $139 when backed on Kickstarter, a price that is set to go up to $199.